In previous three articles in this series, I first talked about how you can plan a trip to Shimla and Manali separately; then I provided a travel plan to cover both these places in the same trip. In this article, I will provide a sample itinerary on how you can further extend your trip and include Dharamshala and Dalhousie in your plan. This will again be a week long trip where you will visit all four destinations; Shimla, Manali, Dalhousie and Dharamshala. Please note though that extending the trip and adding these two destinations will mean that you will end up traveling a lot. While keeping the trip limited to Shimla and Manali meant more of a relaxed journey; visiting all these 4 places will have you spending a lot of time in your car. On the upside though, you will explore many different places; and even the drives from one place to another will be quite scenic. Best way for this trip of course would be by your own vehicle because moving from one place to another and depending on public transport will not be that convenient. Below is a 10 day itinerary of this trip covering all four places. For the sake of this article, I will assume that you are starting your journey from Delhi. If your starting point was different, then the travel on first and last day will be different; rest of the details will still apply. It is a total of about 350 kilometers long drive. From Delhi, you will reach Amblala via NH1. Just before Chandigarh, you will take the diversion on Himalayan Expressway and head to Shimla from there. The road is mostly good but there is some road widening work going on between Kalka and Shimla which may cause delay. You can either chose to stay at Shimla; or at any of the nearby places like Kufri or Mashobra. You will spend this day in Shimla and indulge in some local sightseeing. You can take a walk on the ridge, trek to Jhaku hill and spend some time at Mall road in the evening. Today you will drive from Shimla to Manali. This will be a bit of a long journey so an early start is advised. There are multiple routes that you can take for the journey off which, I will recommend traveling via Tatapani. You will exit near Sundernagar and then head to Manali from there. If you want to include a high altitude pass as well and a bit of off-roading, then take the road via Narkanda, Jalori Pass, Shoja and Banjar. Be advised though that this journey can take you up to 12 hours and will involve traveling on some steep, narrow and bad roads. This day will be spent visiting local places in Manali. Before you start this trip, I would recommend that you apply for a permit for Rohtang Pass online and keep it handy. Please read How to Get a Rohtang Pass Permit for further details on obtaining this permit. Visiting the famous Rohtang Pass will be the highlight of this day. An early start from Manali is recommended, possibly before even the sun came up because the traffic towards Rohtang can really get a bit nasty. 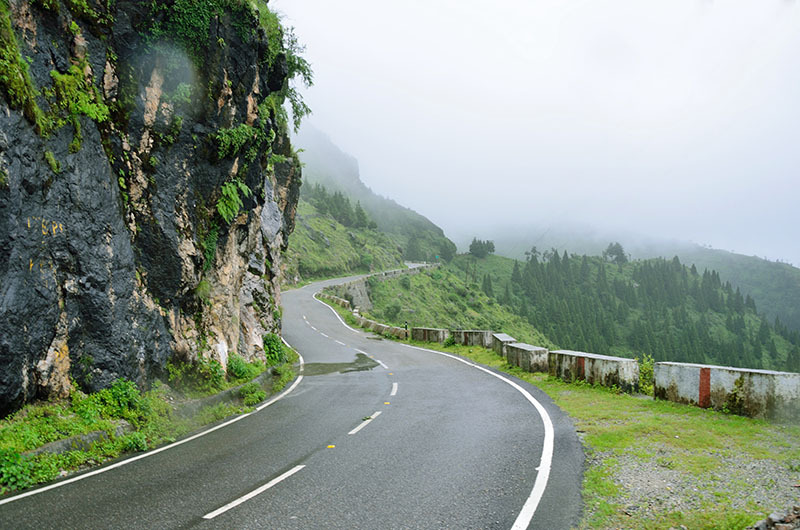 Return to Manali after visiting Rohtang by evening and spend some time at the Mall road of Manali. Also Read: How to Plan a Trip to Manali? For this part of the journey, you can either chose to stay at Dharamshala or Mcleodganj. Personally, I will recommend that you head straight to Mcleodganj and stay there the next day. The route I will recommend for this journey is the one via Mandi, Bir and Palampur. Distance will be just about 250 kilometers but the journey will definitely take you about 8 hours. Traffic jams between Dharamshala and Mcleodganj are a common sight. This day will be spent sightseeing in Mcleodganj. You can visit the local attractions like the monastery, waterfall, Dal Lake and Bhagsunag temple. Or if you are a bit on the adventurous side and up for a walk in the hills, you can trek all the way to Triund from Mcleodganj. Please do note that this trek is considered to be at an intermediate level and involves some steep walking. It will also take you the entire day to finish the trek and you will not be able to visit any other place. To do this in a single day, you will have to start from Mcleodganj early in the morning. This will be about 6 – 7 hours of travel so you can start a bit easy in the day. Reach the famous hill station of Khajjiar and stay at any of the hotels here. You can take a walk through the small hamlet in the evening. You can skip this day completely if you are short on time. But if you are not, then I would recommend that you stay at Khajjiar today and spend the day driving to Kalatop and back to Khajjiar by evening. There is also a forest rest house at Kalatop which is quite scenic. If you were able to get confirmed booking, then you may also spend the night at this forest rest house. For details on how to book these rest house, please read How to Book an HP Forest Rest House? This again will not be a long journey; just 2 hours at most. I will still recommend that you start early in the day so that you have the rest of the entire day for sightseeing in Dalhousie. Nothing much to write about this day except that this will be a long journey way back home. Good part however is that the road is mostly good and you can easily cover it in about 10 hours. I hope the information above was of help. If you need any further details, please feel free to ask in the comments section below; or at our Community Forum; and I will be glad to answer. If you have been to any of these places and have some tips that can be of help to others; please be kind enough to mention those. Hi Vargis, do you use action camera during your trips? Bhai I have been using Hero 5 Black for both these purposes. I am more into still photography and have an entire Nikon gear for it; but not much into videography so I try to make good use of the Hero 5 and my cell phone. LOL. With that being said, if you just need it for trips then GoPro is what I will recommend. It is kinda multipurpose and will come in handy in most situations. If you are however asking Dash Cam for daily use then I can recommend a Transcend one. I don’t use it personally but a friend of mine does and is quite happy with it. Yes you are right. Any advice for xuv 500 smooth functioning in snow? Sorry Bhai. Not much experience in that field yet. I am driving my Thar to Spiti in Feb 2019 so still trying to gain knowledge and experience myself. So far I have mostly done bike rides in snow. More than happy to share pics and videos. Thank you so much for sharing these tips. I appreciate it. To be honest there is nothing to see as such in either Dalhousie or Khajjiar and that too for 3 days each. Both these places are best to just relax and spend some time with family. If you talk specifically in Dalhousie then you can try visiting the St. John Church, Local market. You can also drive towards Satdhara Falls or Paanch Pull but both these are a little outside Dalhousie. You can also take a drive towards Kalatop Wildlife Sanctuary. Same goes for Khajjiar. It is just a tiny Hamlet around a Golf Course (small meadow) and that is pretty much it.There is a Khajji Nag temple and a Golden Devi temple here that you can see. To be honest, do not go expecting a long list of places to see either at Dalhousie or Khajjiar. Just go with the mindset of spendign a few days relaxing and not doing anything. If you were lucky, you may even catch a live snowfall at Khajjiar at this time of the year. 2) it might snow, what i need to do for xuv 500 to run smoothly during snow fall or nothing start. 3) have booked HPTDC hotel in Khajjiar & Dalhousie- supposedly they have best location. Any must here. As always, very big thanks for sharing great info consistently for many years now. Your info was immensely helpful and handy on my last road trip to Gurgaon- Chail- sarhan-Chitkul- kalpa- Nako- Gui-Tabo- Dhankar- Mud village- Kaza- Langza- Losar- Rohtang- Manali- Shoja- Hatu- Gurgaon.